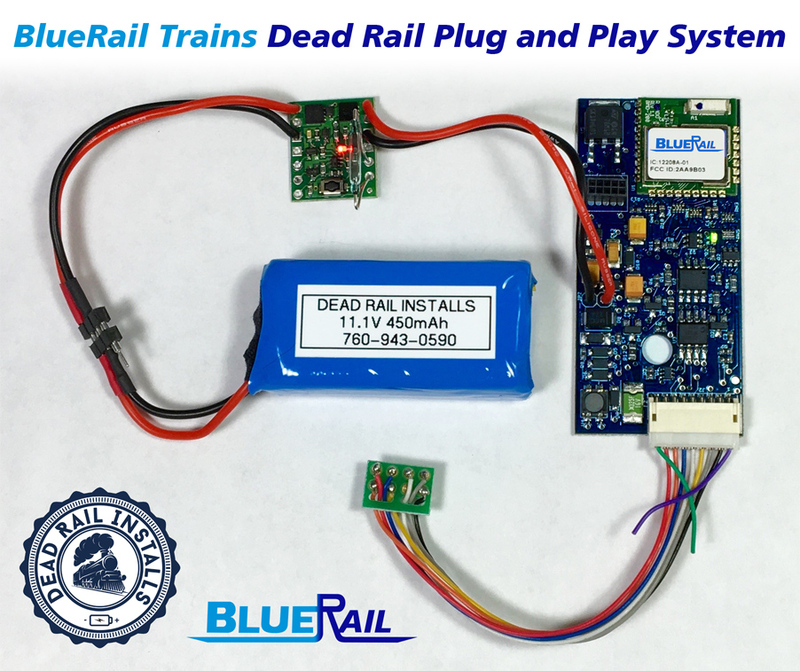 The Dead Rail kit is the first battery power system that is truly plug and play. The kit includes a board, lithium protected battery, magnetic reed switch, a 9/8 pin wire harness, and all connections (assembled). The harness included in the kit is a 9 pin NMRA JST plug to 8 pin NMRA plug. Please use the following guidelines when installing your kit. Be very careful when trying to bend the leads on the magnetic reed switch. Never put pressure on the glass part. Only try bending when holding the leads. Needle nose pliers are good for holding the leads while bending. Mount the on/off switch on a spot near the top or side of the tender or loco shell. Use a reasonably strong magnet. The magnet will work through a plastic shell. A metal shell might require some testing to find a good spot. Do your experimenting before removing the protective sheet over the adhesive. The on/off switch doesn’t need to be attached to the loco as long as it is not in the way of removing the battery. Use a programmable charger. Wall plug in chargers have been known to fail. They charge at a constant rate which may be too high for smaller lithium batteries. Recommended is the Hi Tec RC X1 AC Plus. There are other programmable chargers available. Make sure it has the capability to charge at .1 or .2 amps. Many chargers come in DC or AC versions. DC versions require a separate power supply. AC versions plug into the wall. Charge the 450ma 11.1V pack at .2 amps or 200ma. The battery pack has protection on the cells. This protects against over charge, over discharge, and short circuit. The pack will stop working until the fault goes away. Then the boards will reset and the battery will charge or discharge again. If this happens, discover what the cause is. Is the battery plugged in correctly? It is possible to plug the battery in backwards. The plug is polarized. Nothing will happen. Is the on/off switch in the on position? The red light will be lit when on. The green light will blink on the BlueRail board. Is the harness plugged in tight?